On 16 October in Jakarta, 74 graduates of the Partnership’s various skills development programs, along with more than 60 invited guests, gathered together for the 2018 Joint Alumni Symposium. The annual symposium aims to strengthen networks and the exchange of knowledge between alumni and industry professionals, so that these emerging industry experts can contribute their skills and ideas to Indonesia’s red meat and cattle sector. The topic chosen for the 2018 symposium was ‘Innovation in the Red Meat and Cattle Sector’, and the event featured CEOs of various digital platforms in Indonesia. In his opening remarks, Mr Wisnu Wijaya Soedibjo, Indonesian co-chair of the Partnership, emphasised that Indonesia needs the involvement of academics and youth to contribute fresh ideas and innovations to support growth and investment in the sector. “With the current technology improvements for users, the cattle farming sector must stay strong in facing any challenges, because people need fresh beef every day,” Mr Soedibjo said. “The digital economy is envisaged to support the Indonesia Australia Red Meat and Cattle Partnership, and will further strengthen the relationship between Indonesia and Australia. “We are here to collaborate in seeking new ideas to improve cattle breeding in Indonesia,” added Agriculture Counsellor at the Australian Embassy in Jakarta, Mr George Hughes. “Australia continues its commitment to boost the capacity of Indonesian students and professionals in the red meat and cattle sector. The symposium saw many innovators in attendance, who displayed application-based innovations that can assist in the management, data collection and marketing of beef products in Indonesia. • Mr Badrut Tamam Himawan Fauzi, CEO of Karapan, an online marketplace that provides quality organic and halal beef products. • Mr Dalu Nazlul Kirom, CEO of Ternaknesia, a digital platform that supports farmers through crowdfunding for investments, management and marketing support. • Mr Andri Yadi, CEO of SmarTernak, a digital solution to help farmers and the cattle industry with improved cattle management systems. • Mr Muhsin Al Anas, Project Leader for Gama Sapi 4.0, a digital platform that supports farmers and industry with precision livestock farming. 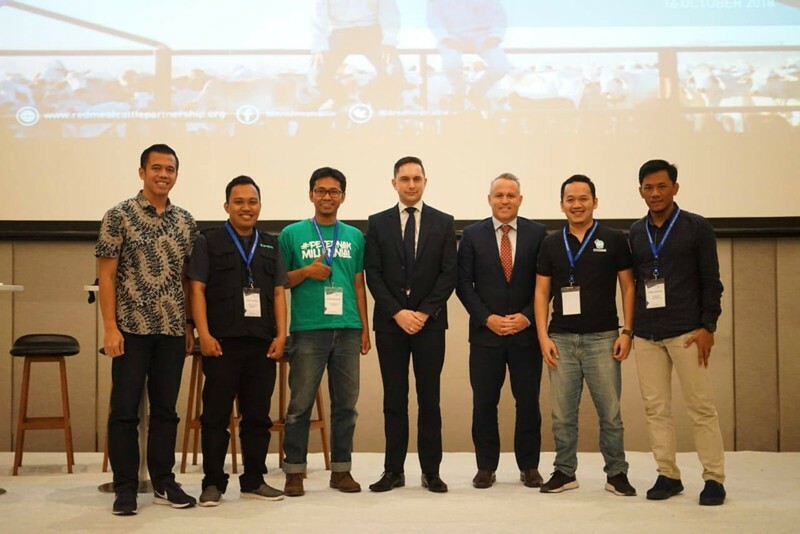 Following the interactive sessions, which were specifically designed to inspire and develop innovations for the Indonesian livestock industry, the symposium was closed with the announcement of the Australia Awards Alumni Grant Scheme. The Australian Government, through the Australia Awards in Indonesia, provides $10,000 - $15,000 for every accepted proposal from all Indonesian nationals who have completed long-term or short-term courses in Australia, including alumni of the Partnership’s skills development programs. This funding supports the application and sharing of knowledge and experience gained by Indonesian participants during their studies in Australia. Alumni at the symposium were encouraged to apply for grants to support their start-up projects. Mr Ashley Manicaros, CEO of the Northern Territory Cattlemen’s Association, which conducts the NTCA Indonesia Australia Pastoral Program for animal science students from Indonesia, stated that the symposium has grown to become an important link between the two countries. “The symposium, like the program itself, is an excellent avenue for expanding the knowledge base in this sector. We look forward to continuing to expand this relationship,” Mr Manicaros said. For more information about the Partnership’s skills development programs and Alumni Grant Scheme, visit redmeatcattlepartnership.org and australiaawardsindonesia.org, respectively. Alumni at the symposium enjoyed a variety of fun and interactive sessions facilitated by Inspirit, designed to inspire innovation and foster creativity. In the Inspiration Session, guest speakers from leading Indonesian digital solutions companies shared their start-up business models and provided valuable insights about the digital economy and the use of innovative technology to benefit Indonesia’s cattle sector. Facilitated by Mr Indra Purnama, Managing Partner of Angel ID, there was robust discussion about the validity of data input in cattle management platforms and how to encourage farmers to make use of digital platforms for cattle management. 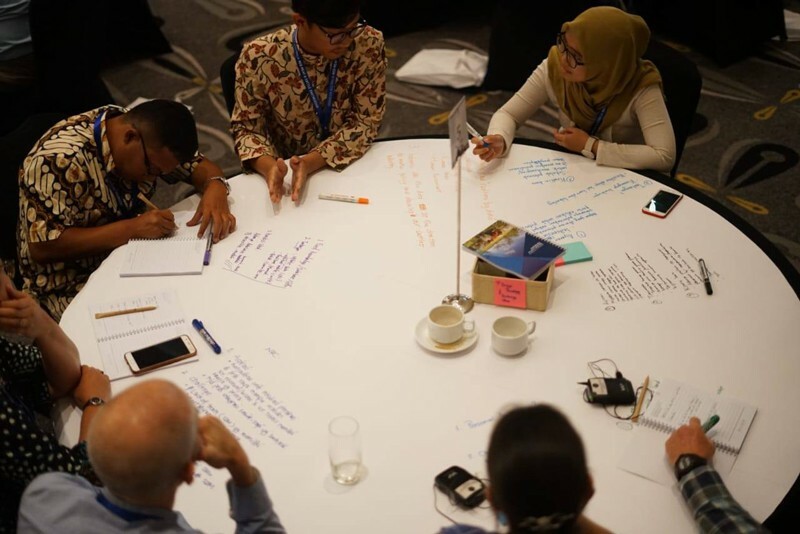 In the Ideas Generation Session, alumni were organised into ten mixed groups, where they could share their individual aspirations for cattle breeding and management in Indonesia and offered views and solutions to issues in the sector. Alumni were encouraged to think broadly about issues and solutions and to not limit their ideas. In the Design Thinking Session, alumni were instructed on the art of negotiation, how to collaborate with team members, and exploring ideas using a design thinking process. Each of the ten groups then worked toward a proposed business concept, with the CEOs observing and providing inputs and questions for discussion. Business concepts proposed included: an app offering solutions to facilitate transportation for meat and livestock all over Indonesia; an app that records data on cattle productivity; an app that can analyse cattle condition (by screening photos of cattle) and provide statistics on body condition; and an app to provide recommendations on the cheapest and most appropriate cattle feed available in specific localities. In the Presentation Session, each group explained their business concept in front of other alumni and these concepts were assessed by the panel of CEOs. The CEOs then provided a general assessment of each business concept and gave their recommendations. Following time for revisions by each group, the three business concepts judged to have the most merit were presented at the final pitching session. All of the alumni involved found the experience both enjoyable and rewarding, and many were inspired to further pursue the ideas and concepts they developed during the sessions.